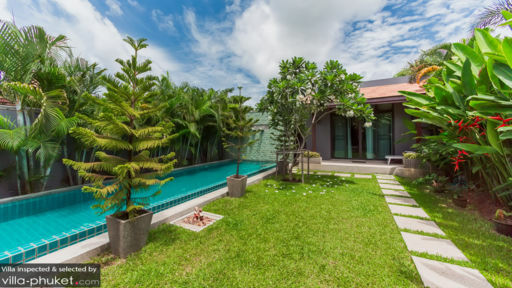 Welcome to Villa Aramoana, a three bedroom vacation rental set in scenic Nai Harn. Aramoana offers a tranquil environment, spacious grounds and a full range of modern amenities - just what every vacationer needs! And with a team of housekeeping staff offering impeccable service, you won’t have to lift a single finger during your stay. Just sit back, relax and enjoy all the luxuries that Villa Aramoana has to offer. Six guests are comfortably accommodated in three bedrooms. Just like the common spaces, the bedrooms are well-appointed with modern fixtures and fittings. Both master bedrooms are bedecked in soothing, earthy tones, and come equipped with a king canopy bed, LCD TV, air conditioners and an en suite. Full-length glass sliding doors allow ample sunlight to cascade in, and provide easy access to the pool and garden. The guest bedrooms are equipped with twin singles, an LCD TV, writing desk, ceiling fans, air conditioners and private en suite. Leafy foliage adorn the neatly manicured garden at Villa Aramoana. 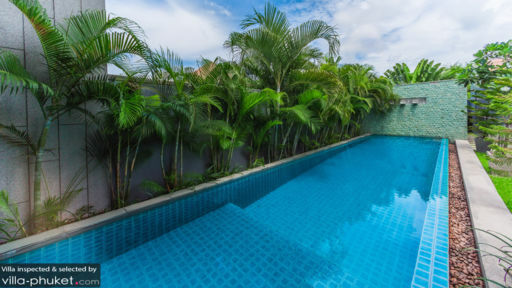 A rectangular pool runs the length of the garden, tempting vacationers to cool down with a dip during bright, sunny afternoons. Linger outdoors to soak up the tropical vibes, or retreat indoors if you prefer lounging in air conditioned comfort. 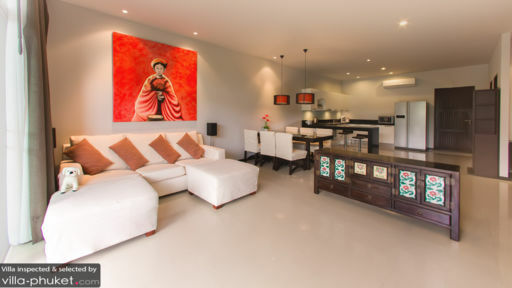 Adorned with modern shapes and furnishings, the living areas at Aramoana ooze style and comfort. A pillowy white couch faces the pop-up LCD TV, offering a comfy seat for vacationers in the mood for catching up on their favourite films. By the couch lies a cosy six seater dining suite, which extends out further to include a fully equipped kitchen with breakfast bar. Hues of white, black and gray dominate, and along with the contemporary fittings combine to create a chic space where guests will enjoy downing cocktails or whipping up a storm of delicacies. Your stay at Villa Aramoana comes complete with housekeeping and security services. Laundry facilities are available, as is a baby cot for families with young children. Airport transfers may be arranged at additional cost. Villa Aramoana puts beach lovers within close proximity to the coasts (Naiharn Beach is just a three-minute drive away!). Dining options are aplenty, with a variety of restaurants located a stone’s throw away. Take a brief three-minute stroll out, and you’ll soon be surrounded by eateries dishing out Thai, French, German and Italian fare. Rawai Beach is also situated nearby, and if you don’t mind a slightly longer ride, the beaches of Kata Noi and Kata are about a 20-minute drive away. Other locations located within the area include Windmill Viewpoint, Phromthep Cape, Karon Viewpoint and the spectacular Big Buddha.